The drawings are being developed in advance of notations. Nothing much to report really, just that the drawings are moving along. Continue reading "Cube House work progressing"
Much has happened in two weeks. The siding is going on and it looks like the genuine thing - I'm not sure but I'm guessing from the yellow tinge that it may be eastern cedar. Inside the house is closed in. That means the drywall is up, and the joints are being finished. In order to do this all of the work behind the walls had to be completed since the last photos - all the electrical, plumbing, and HVAC rough in had to be completed and the entire house insulated. They are actually getting very close to being finished now. See more at Flickr. 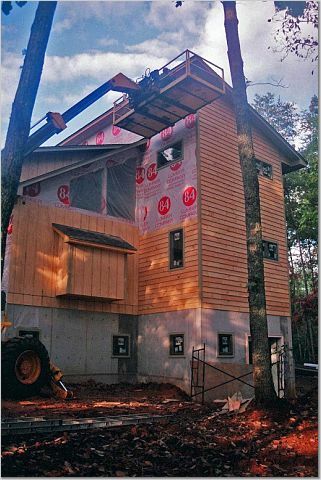 Continue reading "Tray House Construction Photos part2"
The elevation sheet is set up now. I've stayed up too late to finish blocking out the elevations tonight - the posting date says its 21Oct but where I'm sitting its 22Oct! As with the sections I am generating these directly from the 3d model saving some time in development. I often refine the proportion and location of windows while creating the model and I usually have to update the original model templates with these changes when I begin the Construction Prints. This new process eliminates that coordination effort. And so the layout of the elevation sheet. Thats it - the main sheets are all set up and I'll start developing them up now. 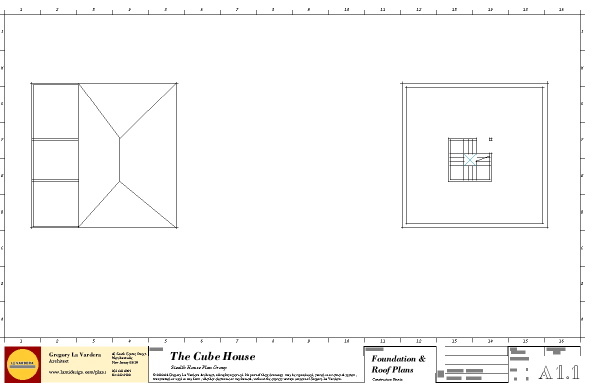 Continue reading "0380 Cube House elevation sheet"
Usually the elevation sheet comes first, but the section of the Cube house is so interesting that we were anxious to do it. 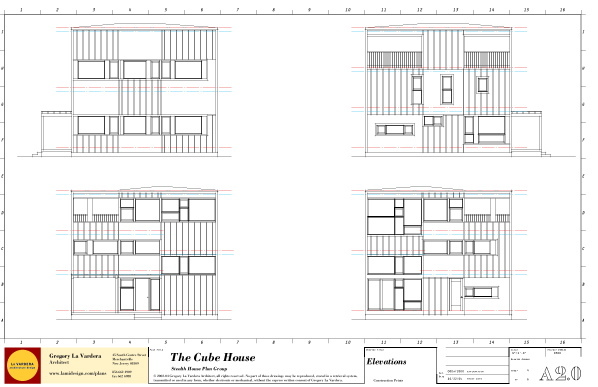 The unusual cross section of the 0380 Cube House is what inspired us to tackle laying out the section sheet first. 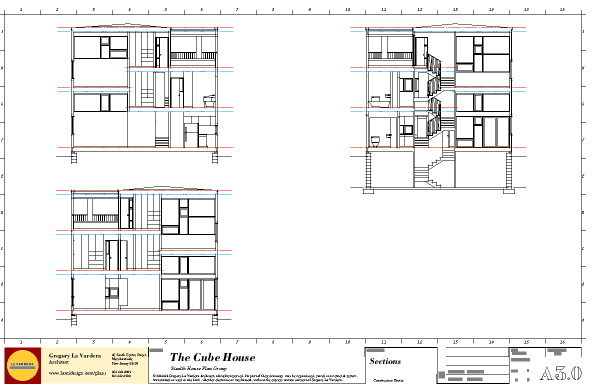 There was not room to show 4 sections on the sheet as with the basement there each section drawing was too tall - the elevation sheet neatly fits all four sides. Rather than show 2 sections on a sheet I decided to do two sections with the basement truncated and the section through the stair showing the entire basement. 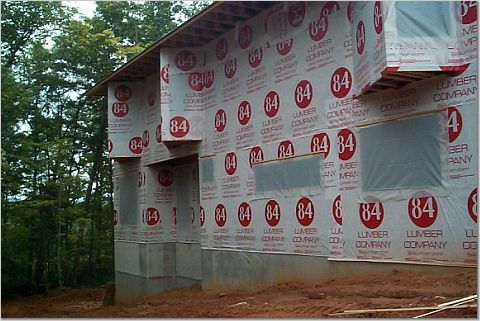 And yes, before you ask, we can prepare versions with slab foundations or crawlspaces as well. We are trying to leverage the work already done in the 3d model now by exporting the base lines for the section drawings directly from the 3d model. It saves drafting time and provides a better representation of a section through the house via all the detail in the 3d model. 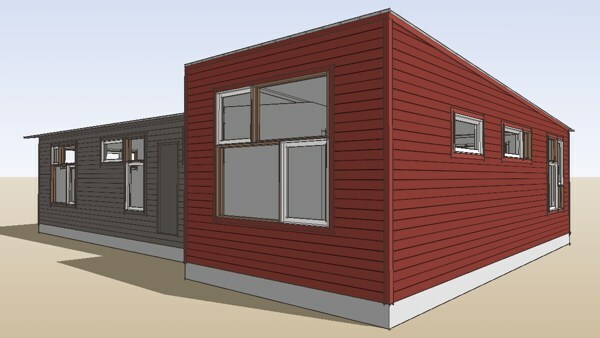 Continue reading "0380 Cube House section sheet"
Sara and David Sage have started a blog to track the creation of their modular home. My clients for the modular project have created their very own blog to report on the progress of their own project on LiveModern. They will no doubt give you more info on the nitty gritty behind getting this project off the ground - the things that you the home owner want to know so you can get your own project to happen. I look forward to their experiences. Reading the first two entries today is fascinating. The architect is only a small part of the process and Sara's description really hits that home. I think there will be a lot to glean from watching this. One of the color studies we did with Sara's colors. I'll tell you - to me its humbling. Doing a good job with the design of the house is important no doubt, but it is just one part of the whole process. The factory, the on-site contractor, and as you will see, the client must be masterful with their roles as well. 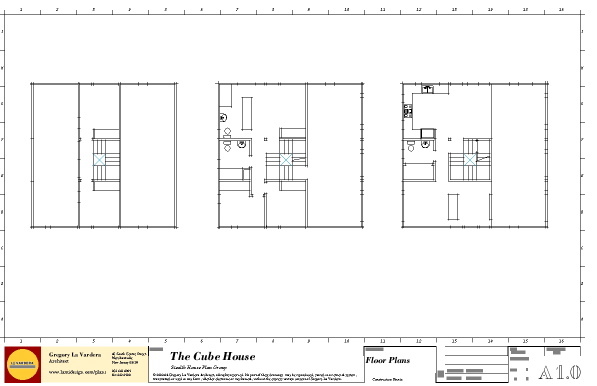 Continue reading "modular clients, Sages, start blog"
Continue reading "0380 Cube House goes into Production"
A floor plan was requested. This is the floor plan as it stands at the time of this posting. I think its quite roomy for 3 bedrooms at 1400 sqft. The colors on the plan correspond to each modular section of the house. We had them tinted like this to convey how we planned them to be arranged for the factory floor and for transport as shown in this diagram. Continue reading "more info on Modular Project"
Some schematic views of a modular house project I've been working on. I have been working on the design of this house and with the client's blessing I am going to share some images of it today. It is our first foray into a house built with a modular system so it has been a chance to exercise some of the experience I have been building as prefab has become such a popular idea. The side of the house above faces towards the strret. The un-rendered white area will be a deck and porch that wraps around the corner of the house. The site has a side yard orientation, so the back and other side are treated more like side yards and the living space's connection to the outdoors is primarily from the side. The footprint is about 1400 sqft and based on sketches brought into the process by the clients. There are 3 bedrooms, two baths, and open plan kitchen dining living area, and a small family room area as well. 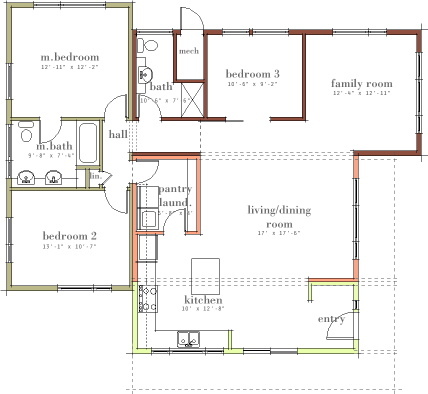 There are 4 modules, two containing the bedrooms and family room, and two that join to form the living and kitchen area. The four modules join in pairs to fit into two factory bays, and ship on two trailers. 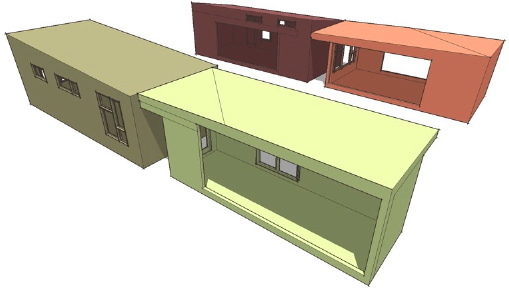 The roof heights are low to avoid the need for separate roof modules which would consume more factory space and more trailers/transport cost. I know everybody is going to want to know what it costs - they don't have final numbers yet. They are going to be doing a great deal of the finish work themselves on site with friends and family for labor - even modular building can not beat sweat equity. As I learn more I'll try to quantify it. 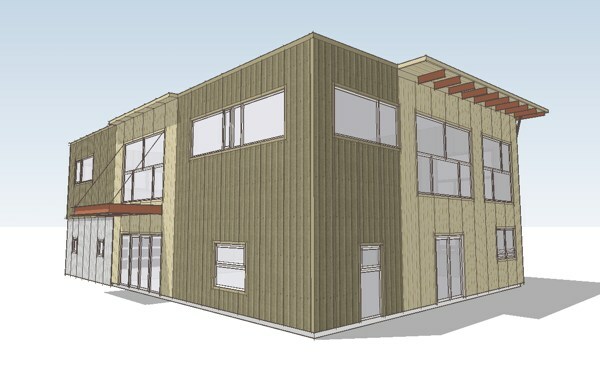 Continue reading "a modular house project"
a design study for a steel house I have been adding a bit more detail today so I thought I would post another image, this time of the front of the house. 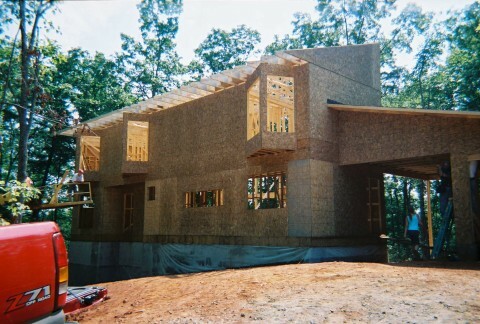 Continue reading "Another image of the 6040 House"
Continue reading "Tray House Construction Photos"